Different sensory systems, by extracting specific forms of energies reflected or generated by the objects around, allow communication of the external world with the internal body states (Nelson & MacIver, 2006). The sensory systems perform multiple levels of processing on the incoming information in order to extract what is relevant for the organism. Neuromodulators play an important role in sensory processing and are vital for understanding the context-dependent regulation of sensory information. Serotonin is one such neuromodulator, whose influence on local circuits is often complex and multifaceted. The olfactory sensory system of the fruit fly, Drosophila melanogaster, is one of the well-studied neural circuits. The basic architecture of the olfactory system in insects shares a high degree of similarity with that of its mammalian counterpart. The availability of numerous transgenic tools allows the identification and manipulation of a subset of neurons, which make the Drosophila olfactory system an attractive model to answer questions related to sensory regulation. 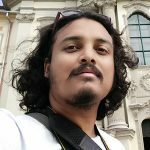 Furthermore, an understanding of neuronal connectivity has been greatly accelerated through the release of freely available, synaptic resolution electron microscopy data from the entire adult Drosophila brain (Zheng et al., 2018). In the fruit fly brain, the serotonergic input in the primary olfactory centre (antennal lobe) comes only from a pair of neurons called the contralaterally projecting, serotonin-immunoreactive deutocerebral neurons (CSDn). Interestingly, each of these neurons send projections to second order processing centres (lateral horn and mushroom body) and to third order processing centre – the superior lateral protocerebrum (Coates et al., 2017). Thus, each CSDn represents a widely projecting modulatory neuron innervating different areas of the brain. In this work, the authors compared odor-evoked activity between the CSDn neurites in the antennal lobe and the lateral horn, which yielded surprising insights. Zhang et al. utilized fluorescent microscopic techniques for monitoring neural activity in the CSDn. The authors found that all the tested odors (with the exception of Ammonia) inhibit activity in the CSDn neurites of the antennal lobe (AL) (as also shown previously by the same group in Zhang & Gaudry, 2016). Although odors inhibited CSDn at the level of AL, the higher level arbors in the lateral horn (LH) showed odor-induced excitation. Thus, for the same stimulus, different neurites of the CSDn show simultaneous inhibition and excitation. Moreover, while all the AL-neurites of CSDn seem to be uniformly inhibited, the LH-neurites showed odor-specific spatially segregated excitation pattern. I – Reconstruction of a single CSDn from electron microscopy data (From Figure S3A). II – AL and LH neurites of a single GFP-labelled CSDn (white) are pointed out in the Drosophila brain (blue) (From Figure 1A). III – For the same odor stimulus (p-cresol, in this case), AL and LH neurites show different responses (as depicted through a time series of ΔF/F) (From Figure 2E). To determine whether the AL and LH compartment’s physiology is interlinked or independently regulated, they performed simulation experiments by constructing a computer model of CSDn. The model utilized EM reconstructions from the whole fly brain EM dataset (Zheng et al., 2018), and the parameters measured from in vivo electrophysiological recordings of the CSDn. Through simulations, the authors determined that the best fit model predicts preferential propagation of voltage from the AL to the LH. This prediction found support in their in vivo experiment where 2-photon laser-mediated transection of the CSDn connection between the LH and AL showed increased odor-evoked excitation in the now isolated LH neurites. Thus, although spatially segregated neurites are activated or inhibited through their local inputs, the local voltage changes do have a role in shaping the final output of distant neurites. Such influence on distant neurites are influenced by the geometry of the neuron, that favours one direction of voltage propagation over the other. This work, along with their previous work (Zhang & Gaudry, 2016), that demonstrates serotonergic CSDn to be co-expressing the excitatory neurotransmitter acetylcholine, brings forward a very multifaceted neuron, that seems to be equipped with different modes of target regulation. Modulatory neurotransmitters often have opposite or context-dependent effects on different local circuits of the brain. This work takes it one notch further by showing how a single modulatory neuron can have spatially segregated differential activity. This work is likely to accelerate search for similar modes of local circuit regulation in other systems, although identification and manipulation of identified neurons, across different animals, is highly challenging in vertebrates. With an enhanced understanding of CSDn physiology, the next challenge will be to establish a concrete causal link between CSDn activity and the animal’s behavioural states. Serotonin has often been known to regulate complex behaviours, and as CSDn has input sites in multiple areas of the brain, it is likely that its physiology will be influenced by other factors. This can provide contextual information that may influence olfactory processing through CSDn. Additional factors are also likely to add to the complexity of serotonin regulation in the olfactory system. Drosophila has five serotonin receptors that, if expressed differentially in the post-synaptic partners of CSDn, can exert differential responses through CSDn-mediated serotonin. Experience-dependent changes might also alter synaptic strength or numbers of CSDn neurites, that can induce differences in CSDn-mediated odor processing. Earlier work by the same authors (Zhang & Gaudry, 2016) demonstrated CSDn-mediated serotonin to have inhibitory effects on AL neurons. Can the authors comment on the likely effects of CSDn stimulation in LH? Do CSDn terminals in LH also co-express serotonin and acetylcholine? Ammonia was the only odor that induced excitation in both the AL and LH neurites. Is ammonia-sensing circuitry known to be different than others? Can the authors provide some insights into this exception? In the two-photon laser transection experiment, judging by the size of the cavitation bubble (Fig. 4 G), it is very likely that other neurons that connect AL and LH are also getting severed. In that scenario, the changes observed maybe a consequence of the non-CSDn transection, which might not be accounted for by the contralateral transection control. In the absence of controls that injures the neighbouring areas (while keeping the CSDn intact), can the authors discard that possibility? Coates, K. E., Majot, A. T., Zhang, X., Michael, C. T., Spitzer, S. L., Gaudry, Q., & Dacks, A. M. (2017). 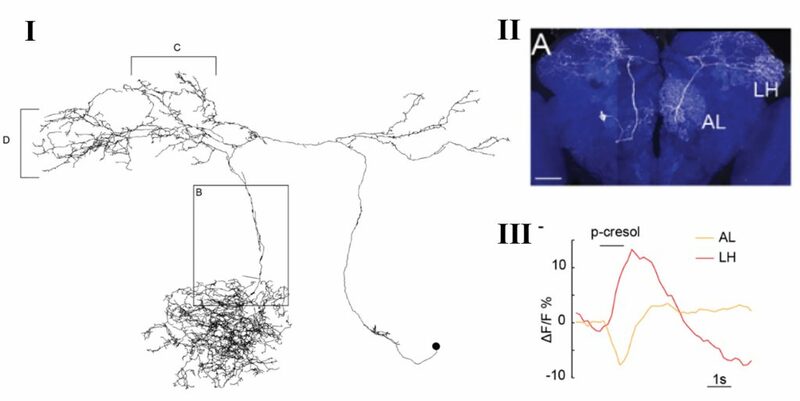 Identified Serotonergic Modulatory Neurons Have Heterogeneous Synaptic Connectivity within the Olfactory System of Drosophila. The Journal of Neuroscience. Nelson, M. E., & MacIver, M. A. (2006). Sensory acquisition in active sensing systems. Journal of Comparative Physiology A: Neuroethology, Sensory, Neural, and Behavioral Physiology. Zhang, X., & Gaudry, Q. (2016). Functional integration of a serotonergic neuron in the drosophila antennal lobe. ELife. Zheng, Z., Lauritzen, J. S., Perlman, E., Robinson, C. G., Nichols, M., Milkie, D., … Bock, D. D. (2018). A Complete Electron Microscopy Volume of the Brain of Adult Drosophila melanogaster. Cell. Thank you for your great write up of our pre-print. We are flattered that you’ve chosen to highlight it on preLights. Unfortunately, we do not know a lot about the function of the CSDn in the LH, but these are ongoing experiments in our lab. As you mentioned, the antennal lobe is such a great place to study the interactions between modulatory neurons and sensory processing because the basic circuitry of the AL has been so well mapped out. Unfortunately, the LH is not as well-characterized, and it is becoming more appreciated that it will likely be composed of a really high number of cell classes. We also do not know if the CSDn traffics Ach and 5-HT equally between its AL and LH processes. We know both transmitters make their way to the AL from physiological recordings in the AL, but we have not tested for synaptic connectivity in the LH yet. As we learn more about LH circuitry and function, it will really be interesting to see how spatially regulated modulation from the CSDn contributes to perception. Ammonia is in fact intriguing in that it is the only odor that we’ve ever found that excites the CSDn, albeit weakly. Why this might be the case is not entirely clear to us. Ammonia has some interesting characteristics. First, it is a byproduct of fermentation and can be attractive in some circumstances. At higher concentrations it can also be aversive. However, we tested numerous other attractive and aversive odorants, including several other fermentation byproducts, and the excitation by ammonia cannot be explained by odor valence alone. Ammonia is also interesting in that it is detected and encoded by a specific class of ORNs that are narrowly tuned to this odor. However, when we tested other olfactory channels with equally narrow and specific tuning, we again found inhibition. So not all odorants that activate select ORs will cause CSDn activation. The inhibition of the CSDn is highly correlated with the total number of ORs that are activated on the antenna and the total number of activated ORs correlates strongly with the amount of lateral inhibition that is recruited in the AL. So the simplest explanation for why ammonia activates that CSDn is likely that ammonia simply does not recruit a lot of lateral inhibition. It’s just unclear why that might be beneficial ethologically. Non-specific damage is always a concern with transection studies. However, there is a lot of literature that shows that the damage is typically restrained to the axons that are expressing a fluorophore, usually GFP but in this case GCaMP. So, it’s unlikely that non-GCaMP expressing axons are being damaged. The cavitation that is seen is from the basal GCaMP fluorescence belonging to the CSDn. We also had another advantage in our experimental set up that makes us more confident about our result. If the laser transection were causing non-specific damage, we would expect the treatment to have cut projection neuron (PN) axons from the AL and greatly reduced CSDn activation. Instead we saw boosting which would not be consistent with damage to axons of passage from the PNs. Finally, it is important to test hypotheses using as many different approaches whenever possible. In this case, we were able to use our model to predict that we should have seen boosting of CSDn responses in the LH when we isolated the structure rather than suppression. Because our results are consistent with our modeling, we get more confidence in the experimental data as well. Nicholas Steinmetz, Peter Zatka-Haas, Matteo Carandini, et al. Rodrigo R.R. Duarte, Nathaniel D. Bachtel, Marie-Caroline Cotel, et al. Vanessa Martinez, Elise Nowbahari, David Sillam-Dussès, et al. Summer B. Thyme, Lindsey M. Pieper, Eric H. Li, et al. David Bierbach, Tim Landgraf, Pawel Romanczuk, et al. Lysanne Snijders, Ralf HJM Kurvers, Stefan Krause, et al. Kory M. Evans, Maxwell J. Bernt, Matthew A. Kolmann, et al.